I haven't written to much lately, Mom hasn't been doing well. At least I thought she hadn't until today. For the past couple of weeks it's been really tough getting her out of bed, and to eat. There have been several days she's only eaten one meal and twice I feed her in bed because she was tired and didn't want to get up. Well today things changed dramatically in a good direction. Mom was up at 8:30 and all on her own I might add. She ate a hearty breakfast, but then again she has been eating well nearly every morning, then went back to bed like she does every day. About an hour later, while I was trying to write a cigar review, I heard the slider behind me open and to my surprise it was Mom wanting to come outside. We've been trying to get Mom outside for well over a month now and she has been out, but only for a minute or two. 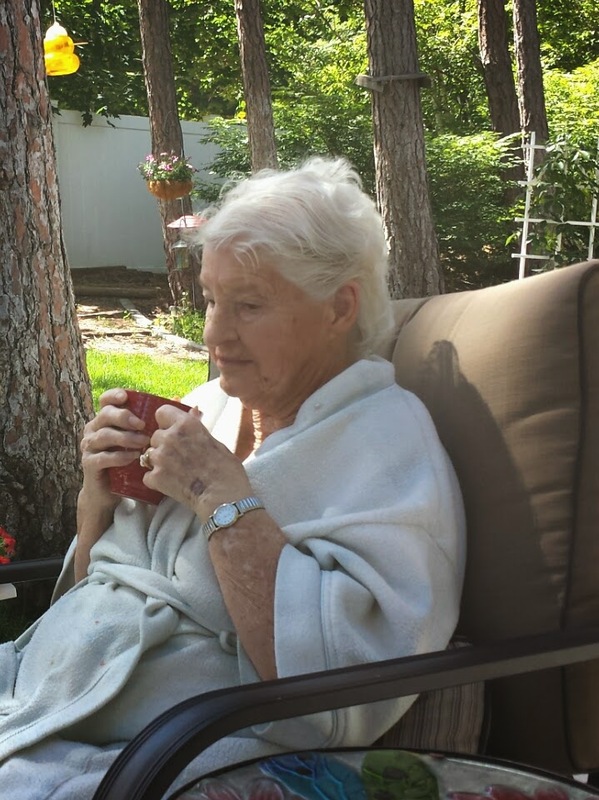 Today, she came out, sat down and had a cup of coffee while we talked. It wasn't a real conversation, Mom can no longer keep thoughts long enough to carry on a conversation, but we talked about the yard, trees and flowers while she drank a cup of coffee. After about forty-five minutes she'd had enough of being outside so I helped her back inside. But once again she surprised me. Instead of heading straight back to bed she grabbed the paper, sat down in her rocking chair and read for about an hour before heading off to bed. But wait! That's not the end of today's story. About an hour later Mom poked her head out into the hall, when Paula asked if she needed anything, she sad she was a bit hungry. We made made lunch for Mom, she ate about half and then disappeared into the quiet abyss of her room once again. Today was encouraging, it was nice to see Mom up and eating more. If we can get her out in the sun more the next few days that should help too. It's odd though, today is the first day in a sound three weeks that Mom didn't mention aunt Laura. I don't really know what the correlation between the two is, but maybe she is having a better brain function day, or maybe it's that she hasn't slept and dreamed as much. Today will ease my worries about what I will find when I wake Mom for dinner and maybe even for the next few days. Why ask Why: How Can You Do This?